Not my first choice for breakfast, but it's been my go-to lately. I go through phases for breakfast. Sometimes I'll have egg and cheese bagels, or a whey protein smoothie, or just plain eggs and bacon. Cereal, while tasty, has somehow fallen out of my rotation. It might be because I would get hungry again only an hour after eating cereal. Oatmeal, however, was never in my breakfast rotation. The texture isn't my favorite, but I have been giving it a try lately. The maple brown sugar is the only kind of oatmeal I've been willing to buy. It smells amazing while it's heating up in the microwave, and has a great taste, as well. The texture is still iffy for me, but I'm getting over it. The best part about eating oatmeal in the morning is that I am full for quite some time. 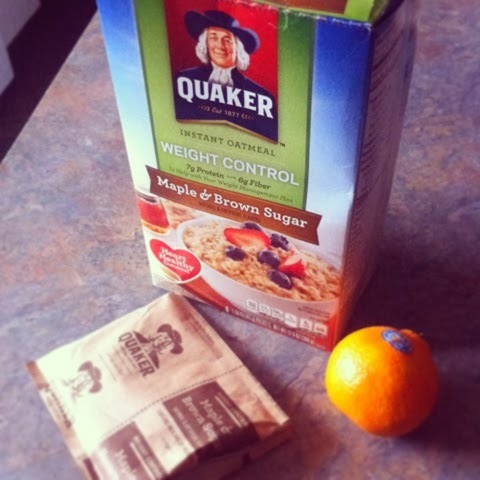 Fullness is a factor that I always consider when picking food to eat; and this oatmeal has it! Oatmeal lovers: what are your favorite flavors? Tonight, I am going to go grocery shopping and will write out my workout schedule for the week. I am thinking I will either run or do some zumba tonight. I have a busy week ahead, so I am looking forward to getting everything organized tonight. I eat that same oatmeal every single morning but I also cut up a Granny Smith apple into bite size pieces and mix it in after warming it up. Soooo yummy and helps with the consistancy feel. Annnnd, you get in a serving of fruit!! Give it a try! !